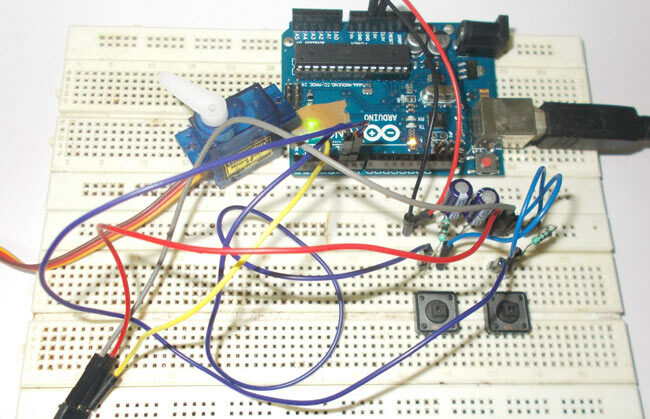 In this tutorial we are going to control a servo motor by ARDUINO UNO. Servo Motors are used where there is a need for accurate shaft movement or position. These are not proposed for high speed applications. These are proposed for low speed, medium torque and accurate position application. These motors are used in robotic arm machines, flight controls and control systems. For the shaft to be moved to 12o clock the ON time of signal must be 1.5ms and OFF time should be 16.5ms. This ratio is decoded by control system in servo and it adjusts the position based on it. This PWM in here is generated by using ARDUINO UNO. Hardware: ARDUINO UNO, power supply (5v), 100uF capacitor , buttons (two pieces), 1KΩ resistor (two pieces), Servo motor (which needed to be tested). In normal cases we need to go to the registers of controller for adjusting the frequency and for getting required duty ratio for accurate position control of servo, in ARDUINO we don’t have to do those things. In ARDUINO we have predefined libraries, which will set the frequencies and duty ratios accordingly once the header file is called or included. In ARDUINO we simply have to state the position of servo that needed and the PWM is automatically be adjusted by UNO. First we need to set frequency of PWM signal and for that we should call “#include ” header file, on including this header file in the program, the frequency gets set automatically and we get to use some special conditions, which enables the user to enter needed position of servo directly without any fuzz. 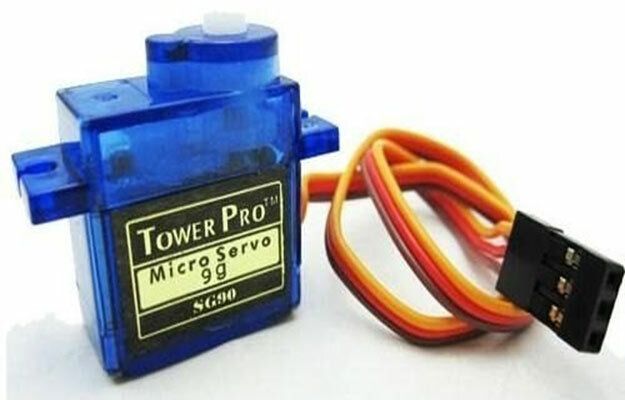 Now we need to define a name for the servo “Servo sg90sevo”, here ‘sg90servo’ is the name chosen, so while writing for potion we are going to use this name, this feature comes in handy when we have many servos to control, we can control as many as eight servo by this. Now we tell the UNO where the signal pin of servo is connected or where it needs to generate the PWM signal. To do this we have “Sg90.attach(3);”, here we are telling the UNO we connected the signal pin of servo at PIN3. All left is to set the position, we are going set the position of servo by using “Sg90.write(30);”, by this command the servo hand moves 30 degrees, so that’s it. After that whenever we need to change the position of servo we need to call the command ”Sg90.write(needed_position_ angle);”. In this circuit we will have two buttons one button increases the position of servo and the other is for decreasing the position of servo. volatile int i=0;//initializing a integer for incrementing and decrementing duty ratio.